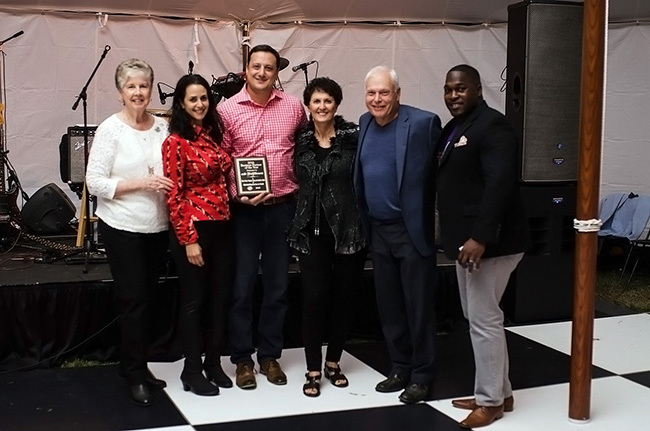 Photo Caption: Pete Nance Boys & Girls Club recognizes corporate sponsor at their annual Moonlight & Motown fundraising event. From Left to Right: Dr. Mardel Kolls, Kara Latz, Ayal Latz, Sarah Field, Norman Field, Bob Mackey. On Friday, October 21st the Pete Nance Boys & Girls Club (PNC) named a2b Fulfillment as its 2016 Business Partner of the Year. The presentation took place in front of over 400 guests attending the 3rd annual PNC Moonlight & Motown fundraising event. PNC Board Chair, Dr. Mardel Kolls, presented a2b President, Ayal Latz with the award. Also recognized was Sterling Billingsley, The 2016 PNC Youth of the Year award winner. a2b Fulfillment has served as a corporate sponsor for the Boys & Girls Club for the past four years. In 2015, the company donated the a2b Fulfillment Art Studio. One of only a few art studios available to Boys & Girls Clubs nationwide, the workable space gives children the opportunity to explore their creative talents on a weekly basis. “Each week hundreds of children enjoy art activities in our a2b fulfillment art studio as a result of this partnership,” explains Kolls. The Pete Nance Boys & Girls Club, located in Greensboro, Ga. has a mission to enable all young people to reach their full potential as productive, caring, and responsible citizens. For more information about PNC, please visit www.PeteNancebgc.org.